Denis Shapovalov likes to set the tone on the tennis court, using an offence-first approach to dictate pace and force an opponent's hand. That style worked nicely in his first two matches at the Australian Open. Top-ranked Novak Djokovic awaits the Canadian teenager in a matchup that has tournament organizers and fans drooling. Denis Shapovalov likes to set the tone on the tennis court, using an offence-first approach to dictate pace and force an opponent's hand. That style worked nicely in his first two matches at the Australian Open. Repeating that success in the third round will be a much stiffer challenge. Top-ranked Novak Djokovic awaits the Canadian teenager in a matchup that has tournament organizers and fans drooling. An all-time great still in his prime against a top NextGen talent could be a highlight reel waiting to happen. Djokovic is in top form and is a six-time Australian Open champion. One of the game's top defensive players, it'll be fascinating to see how he handles the left-hander's power game. "He's got an explosiveness, I would call his ball wicked," tennis analyst Robert Bettauer said of Shapovalov. "He's got a wicked ball the way it moves through the court, the way it kicks up and the way it's got a lefty spin. So he's very difficult to play against and he's a fearless player. "He's not looking to out-rally or out-steady an opponent. He's looking to out-hit him." Still just 19, Shapovalov has taken on the ATP Tour's big guns before. He surprised current top-five players Juan Martin del Potro and Rafael Nadal during a memorable run to the Rogers Cup semifinal as a wild card in 2017. Shapovalov continued to make strides last season and has risen to No. 27 in the rankings. However, a showcase match at a Grand Slam against the best player in the world is a different beast. "Honestly, there's no pressure on me now," Shapovalov told reporters at Melbourne Park. "Obviously he's the favourite to win. I'm just going to go out there, give it my best shot and see what happens. I think I've been playing really good tennis. So if that continues, I think I could have a chance to really make it a battle and a tough match for him. "Hopefully potentially even try to win the match." Djokovic, 31, won two Grand Slams last season and has won 72 singles titles over his career. Shapovalov has yet to appear in an ATP Tour final. The No. 25 seed from Richmond Hill, Ont., has tremendous range and his retrieving ability is a strong asset. He's powerful, athletic and hungry. But Djokovic, a 14-time Grand Slam champion from Serbia, has seen it all. "I've got lots of respect for him, especially for his determination and professionalism at such a young age," Djokovic said. "He's very mature mentally, which is not really common to see in young players that they feel so comfortable and confident. They're not always backing themselves on the big stage. "He has proven he can beat the big players, so I'm expecting a tough one." 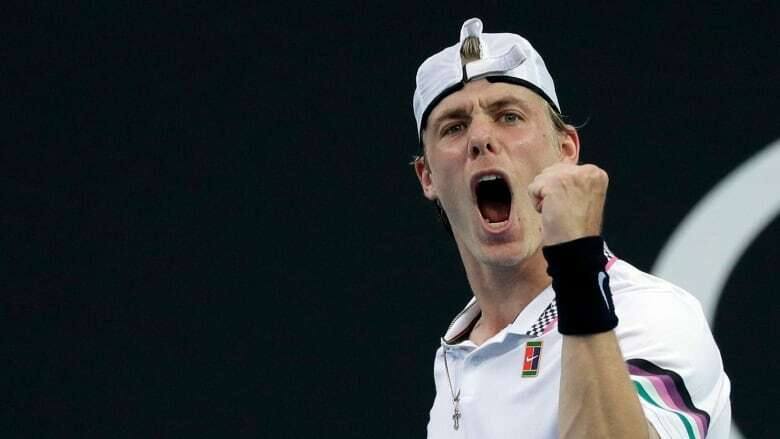 Ottawa native Jesse Levine, a former pro who now works as a coach, scout and broadcaster, said Shapovalov will embrace the heightened attention. "I've seen Denis play since he was 16 years old and he's what we call a gamer," Levine said Thursday from Boca Raton, Fla. "He wants to be in that big moment and he wants to be on that big stage." Shapovalov opened with a straight-set win over world No. 82 Pablo Andujar of Spain. He followed with a comfortable victory over 78th-ranked Taro Daniel of Japan. Bettauer, a former national team coach, thinks Shapovalov is progressing nicely as he enters his third season as a pro. "He's putting in all the important Tour lessons," he said this week from Victoria. "Those first couple of years you play all the tournaments. Get used to the different venues, play all the players, get your wins, take your losses, learn from them and build on that." No. 16 seed Milos Raonic of Thornhill, Ont., is the only other Canadian remaining in singles competition. He'll take on Pierre-Hugues Herbert of France in the third round. "I think he does things at the net well, he tries to play aggressive," Raonic said. "He tries to take swipes at the ball. I think we're both going to be looking for the opportunity to dictate and who can control more." Ottawa's Gabriela Dabrowski and Croatia's Mate Pavic are the defending mixed doubles champions. The top-seeded duo will open against Australian wild cards Priscilla Hon and Alexei Popyrin.